Global retail automation market expected to reach USD 21 billion in 2024, growing at a CAGR of slightly above 10.0% between 2018 and 2024. Retail industry automation is replacing traditional methods of ledger models and cash register, making it more convenient for the customers to do their transactions in a shorter time period. The report covers forecast and analysis for the retail automation market on a global and regional level. The study provides historic data of 2015-2017 along with a forecast from 2018 to 2024 based on revenue (USD Billion). The study includes drivers and restraints for the retail automation market along with the impact they have on the demand over the forecast period. Additionally, the report includes the study of opportunities available in the retail automation market on a global level. 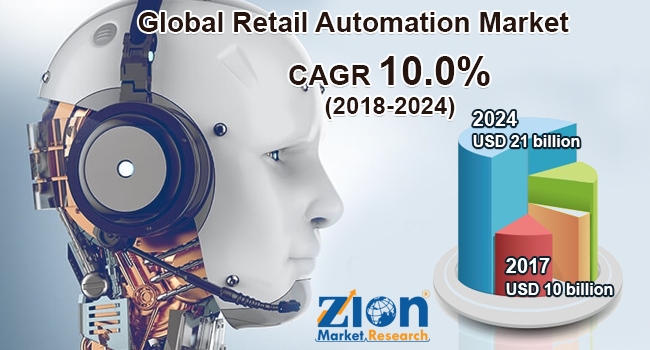 The report offers a comprehensive analysis of the global retail automation market along with, market trends, drivers, and restraints of the retail automation market. This report includes a detailed competitive scenario and the product portfolio of key vendors. To understand the competitive landscape of the market, an analysis of Porter’s Five Forces model for the market has also been included. The study encompasses a market attractiveness analysis, wherein all segments are benchmarked based on their market size, growth rate, and general attractiveness. This report is prepared using data sourced from in-house databases, secondary and primary research team of industry experts. The study provides a decisive view of the retail automation market by segmenting the market based on product, type, end-user, and region. All the segments have been analyzed based on present and the future trends and the market is estimated from 2018 to 2024. Based on product, the segmentation of the retail automation market includes point of sale, barcode and RFID, ESL, camera, AGV, ASRS, and automated conveyor. Based on the type, the segmentation of retail automation market includes vending machines, service kiosks, retail kiosk, self checkout, retail apps, and retail operations. Base on end-user, the segmentation of retail automation market comprises hypermarket, supermarket, convenience stores, fuel stations, and retail pharmacies. The regional segmentation includes the current and forecast demand for North America, Europe, Asia Pacific, Latin America, and the Middle East and Africa. Each region has been further segmented into countries such as the U.S., the UK, France, Germany, China, India, Japan, and Brazil. The report covers detailed competitive outlook including the market share and company profiles of the key participants operating in the global retail automation market such as ZIH Corp., Toshiba Global Commerce Solutions, Inc., Pricer, Outerwall Inc., NCR Corporation, Honeywell International Inc., Fujitsu Limited, First Data Corporation, Diebold Nixdorf, Incorporated, and Datalogic S.P.A.